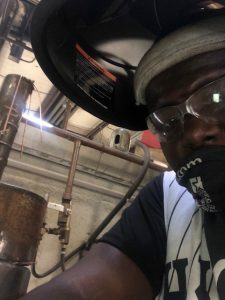 Joshua, 21, from Tuscaloosa, Alabama, graduated from the seven-month Professional Welder program at the Tulsa Welding School, Jacksonville campus on 29 June 2018. Thanks for your time, Josh. Tell us what you did before attending Tulsa Welding School. After high school, I bounced from job to job looking for something I liked. I got a job at a place where they built mufflers. I loaded the mufflers onto trucks. They had welders there, and I saw what these guys were doing. It caught my attention. I got very interested because it looked kind of cool to do. Is that why you decided to go to welding school? Actually, one of my friends started at Tulsa Welding School before I did. He was telling me all about it and because I was interested in it, I thought I might as well go see what it was all about. My friend got a welding job and is going pretty good for himself now. So he’s the one who got me to go to welding school. Did you have any welding experience yourself? Not at all. I’d just watched these guys welding and thought it would be cool to do. Did you go down to Jacksonville to take a tour before signing up? No, I just decided I was going to do it, so I moved to Jacksonville and got started on December 1st 2017. What was your favorite part about your time at Tulsa Welding School? The teachers are a big help. They will get you to the point where you need to be successful in life. With zero welding experience, did you find the program hard? You’re going to get frustrated when you’re learning something new, but don’t let it get to you. Eventually, you’re going to get it, no doubt. As many times as you’re going to do something, you’re going to catch on. Yes, you’re going to get stressed out and frustrated, but it’s worth it! You won’t be stressed out for long if you give it your all. This is coming from a person who had never welded a day in their life. If you could see the kind of welder I am now, you know you’ll get it. Did you enjoy the hands-on time? I did. If you to come in early to get more practice, they let you. If you’re having trouble with something, ask a teacher if you can stay after class and weld a few more to try and get it. What shift did you do? I did the night class and had two jobs. I worked at Wal-Mart and had a welding job as a welder’s helper. I just got a new job in Indian. I’m moving up there later this month to start at Progress Rail. I’m going to be building locomotives, learning how everything works. It’s going to be interesting. It’s a good job with benefits and everything. They’re actually giving me a relocation fee and a sign-on bonus. Congratulations. How did you get the job? The school was a big help. They had a Phase 11 where they introduced us to companies and trained us for weld tests that we needed to pass to get a job. So I really appreciate them for that. How’s the pay compared to jobs you had before welding school? It’s like a $20,000-a-year difference. I’ve more than doubled my salary. I made maybe $18,000 a year before, but I’m looking at $40,000 a year now, and that’s just the beginning! How many of your friends who didn’t go to welding school are making that kind of money? None of them! I’ve actually got two of my cousins to go to welding school. They were interested in what I was doing and found it interesting. They’re enrolled at Tulsa Welding School in Jacksonville now, actually! What’s your career plan from here, Josh? I’d like to be an underwater welder one day, I’ve been looking into it. But I’ve got to build up my welding experience and then get my diving license. I have to become an excellent welder out of the water first. If I like a job, I might stay, but at the moment, I’d like to be at Progress Rail for at least five years. I do want to become an underwater welder, but this is the first step to it. Underwater welders make a lot of money. I’m just passionate about welding. I like getting up in the morning to go welding. I could weld all day just to improve and see how far I can go. I’m getting paid to do something I really want to do. Did you make some connections at Tulsa? The classmates I graduated with have a group chat, and we all stay in touch. A friend of mine who graduated a month before me is going up to Indiana, too. We both came back for the Phase 11 class. When you go in to Tulsa, go in there like you have something to prove. Go in there because you want to do it. Don’t just try to pass. Give it your all. If you give it your all, everything will play out for you. You fell into a welding career really, so what does the rest of your life look like from here? Nothing but progress. If you had asked me just two years ago where I’d be right now, I wouldn’t have said welding!